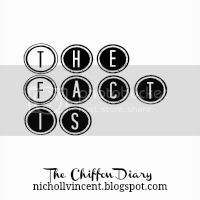 I wanted to come on here and do 'The Fact is' by The Chiffon Diary, who by the way has great style and is such a sweetheart! Here is her latest 'The Fact is' post to see what it's all about. I wanted to do this for today's post because I saw it and thought it was cool! So here I go! Fact: This Saturday I am actually getting my hair cut, since last Saturday wasn't going to work out with my hair stylist. Fact: I am thinking of cutting off all my long beautiful hair and going with a pixie cut! I have done every length but that. Oh but also haven't shaved my head yet or done the long hair shave the side of my head yet either. Fact: I am super tired to the point my eyes are irritating me; i need sleeeeeep! Fact: I love morning text messages with my friend! She's the best oh and also that I miss seeing her pretty face! It's been too too loooooong! Fact: I get excited when I find cool blogs but especially when the bloggers are from where I am from!! Woot, woot!! Fact: In need of a new phone with the newest technology since I am behind. It's between the new iphone & samsung galaxy 3! Fact: I am wanting to really go back to school super badly; I think I am really at my limit at this point. Fact: I am actually scared about going back to school and having to start fresh in a new environment even though before I wanted to be somewhere new, now it's holy chocolate chip brownie sqaures!! Oh and also that I am going to miss my very dearest friend a lot. I mean A LOT! Just thinking about that makes me sad.. no more movies, hanging out, etc. that will be all gone. Fact: I need to get caught up on everything in my life, since I am behind in a lot of different things lately. Fact: I bought 'What to Expect When You're Expecting' and Snow White & The Huntsman on Tuesday and I haven't been able to watch them yet because I am so tired but hopefully soon! Fact: My little niece is the cutest, most precious, sweetest awesome little 2 year old in my life! I love her to ice cream cookie dough pieces! I really want to watch "what to expect when you're expecting"... let me know how it is!